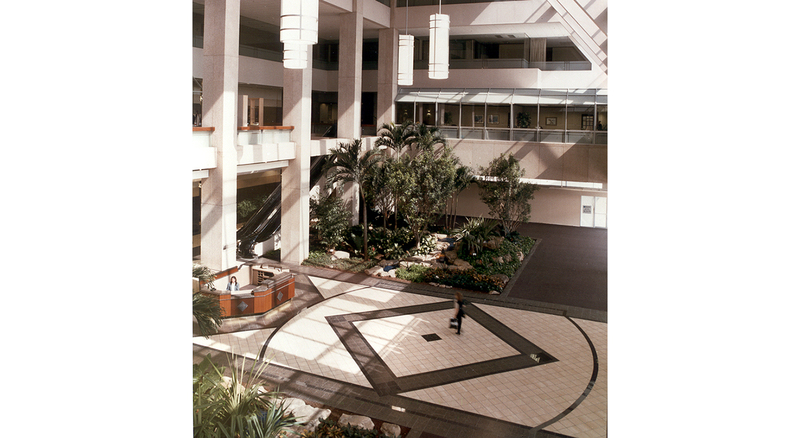 Formerly known as ‘Independent Square’ the Modis building was Florida’s tallest building when first built in 1975 by KBJ Architects and still remains a Jacksonville landmark today. The building occupies a full city block and is located in the central core of downtown Jacksonville. The ground level is dedicated to public spaces housing restaurants, retail stores, and other urban amenities. The main feature of this level is large indoor tropical park, with full size trees and a sloping glass wall giving it a greenhouse effect. Escalators connect the street level to the second floor, which contains additional retail space and a 400 seat auditorium. The top two floors of this 37 story building contains a private dinner club, which has incredible views of the St. John’s River. With a custom designed ceiling, high velocity air system, sprinklers, and smoke detectors the building was a forerunner of life safety design features. Nearly 25 years later in 1999, the owner’s asked KBJ to renovate parts of the interior to keep the building suitable to our times and to help it continue into the future as one of the finest buildings in Jacksonville.